........Currently, I am not using anything, but when (if...lol) we get moved into our new house, I plan on setting up a border around the play yard area & filling it w/ either cedar or bark mulch. I thought about pea gravel, but my best friend has it & whenever her dh mows, it kicks it back up. Last week, a piece kicked up & got lodged under the skin on his lower leg. Ouch. ........I use indoor/outdoor mats they connect like a puzzle (colors red, blue, yellow and green). I bought them from Sam's Club for $7.67 for 4 of them. 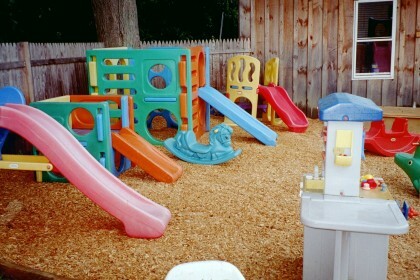 I use these underneath my swing set and I also use them for my daycare rooms. I really like them. ........I use shredded mulch. I don't like it much because the kids' clothes get dirty and dark, and I hear the colored mulch (cedar) is much better at repelling ticks and mosquitos. So if this is true I would like to know. The mulch also gets ground into the dirt and you have to replace every year. ........I use cedar mulch. It doesn't get the "muddy" texture when wet - but it does still get messy when it rains. It also still sticks all over clothes no matter what. But is softer than other mulches I've used. It also biodegrades a little slower in my personal opinion. I'm only replenishing once a year now. As far as all of your play yard options I think they include: Grass, Mulch, Pea Gravel, chipped rubber, expensive rubber ground covers. Like I said - I opt for mulch because it's "natural" - it does biodegrade - and it provides the needed padding. I've had some bad experiences with pea gravel (trips to the ER to remove it from the nose of a child at a center where I worked!). If you use chipped rubber - it's not at all a "natural" outside element - and be careful that it was not made from steel belted tired or you'll have little pieces of steel in the chipped rubber. And if you find a grant somewhere the actual rubber (track like) covers might be an option - but I don't know many providers who can afford them without a special grant or something lol! ........Another benefit to pea gravel is that unlike Mulch, which usually compacts over time, it has more "give" when a child falls and is less likely to cause serious injury (ex. fractures of the small bones within the elbow joint). ........What is pea gravel? Very small rocks - very dusty - almost muddy when wet - and they fit way too perfectly in ears, noses .... and even with good supervision to prevent their insertion into body parts they end up in shoes and socks. They are cheap - and do make an effective ground cover for playgrounds. They do not biodegrade though - not really part of the "natural" environment (like mulch would be) and the small pieces of the pea gravel (little rocks) tend to get tracked in MANY areas in addition to the play yard. Another benefit though is that because they do not biodegrade - pea gravel ground covers need to be replaced less often. It just all depends on what you are looking for. I personally saw (three) too many incidents with pea gravel being put in children's body parts (I think I shared that one boy at a preschool I worked at had to go to the ER to have 6 PIECES removed from one nostril). I personally also feel that playgrounds (especially outdoor ones) should be kept as "natural" as possible. The mulch is a natural element already found in nature, the cedar mulch I use is a natural bug repellent, mulch drains naturally after rain ... it biodegrades "naturally"... Anyway - that is just something that I personally value. It's not that much more expensive than pea gravel, and you can buy it just about anywhere. ........If your mulch is at the correct depth for the age children and type of play equipment it is a more effective cushion as the mulch can actually "give" under pressure - but it would take a lot more than a child to make a rock (even a small one) bend or give. I'm not saying pea gravel is terrible ... but it really isn't a "Better" cushion than mulch. There are depth recommendations though depending on the age of the children using the play equipment, and the type of equipment. Also, over time mulch does need to be replenished ... that's why it's a more natural ground cover because it does actually compact and biodegrades. But if you add more when necessary - and you should be raking it anyway to make sure there are no unsafe objects in the mulch - it is a very effective cushioning. ...........I have pea gravel on my playground, a base depth of about 6". Yes, they are very small rocks (roughly the size of a pea, thus "pea gravel"), about 1/2" in diameter. I've never had a problem with it being dusty and never, ever has it been muddy. Now the stuff they have at our elementary school, like very coarse sand, that gets very muddy. It may all depend on the size of gravel you get and how deep you make it. But I've had this for 8 years and never had a problem with being dusty or muddy. We paid $130 for a 10-ton dump truck load of gravel. Trust me that's ALOT of gravel. Never have needed to replace it, and never have had any problems with the kids, other than the young toddlers trying to eat it sometimes, and they do like to throw it sometimes as well. Luckily they've not tried to put it anywhere else in their bodies. We've also taken lots of it over the years for other things (drainage in the bottom of flower pots, arts and crafts projects, fish tank gravel, etc.) but yes, the bad thing is it NEVER biodegrades. I have no earthly idea what I will do with the stuff when I no longer have daycare here. I've had mulch in the past and it makes a huge mess on clothes, I've had kids get splinters (large ones at that) and to me, it didn't provide the cushion that our pea gravel does. You'd never think rocks could make for a soft landing, but it really does. I guess what you use is a matter of personal preference, and no one material is perfect.